Sometimes you might be required to export Active Directory user information to CSV. 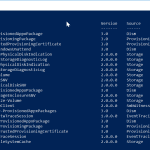 The Powershell export AD users to CSV (Export-Users) function accomplishes that for you. It exports all users in a specified OU into a CSV. It is a full function with parameters. This allows you to run it like any other cmdlet, supplying parameters. This might be help you determine users with missing fields like office, email address. It may also be required for other purposes. I used the Powershell export AD users (Export-ADUsers) function in a project that required me to export these fields so that the project team can populate missing fields. Once the fields have been populated and sent to me, I updated the users (using the received CSV) using another PowerShell script, ImportADUsers. If you require ImportADUsers script, download it here (to be uploaded soon). DISCLAIMER: This script is published on “As Is” basis. I will not take any responsibility for any damage this script might do to your production or test server environment. Please ensure that you test this properly in a non-production environment before running or scheduling the script in a production environment. This entry was posted in PowerShell Scripting, Powershell Scripts and tagged Active Directory, Active Directory User Accounts, ActiveDirectory, AD, ADSI, csv, excel, Export-ADUsers, powershell, PowerShell Module, Users.